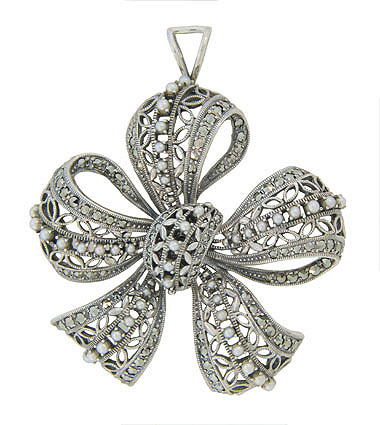 This gorgeous sterling silver pin-pendant is fashioned in the form of an elegant three looped bow. The delicate ribbon is decorated with leaf shaped filigree, seed pearls and maracasite. The antique style piece features both a loop to hold a chain as well as a pin back. The piece measures 2" long, 2" wide.